Operator comfort isn’t about making the workday easy. It’s all about making every day as productive as possible, even when it starts before sunrise or stretches past sunset. The Maxxum operator environment is designed to make the long hours, and the tough tasks, fly by. The Maxxum Series provides unmatched visibility, and industry-leading cab suspension. All in all, the Case IH Maxxum cab provides the comfort and ease of operation needed to maximise in-field performance during long workdays. Reducing the shock loads to the operator by 25 percent, the Maxxum cab suspension offers superior operator comfort, both on the road and in the field. Designed with durable components, this continuously active, adjustable system offers five settings and a full four inches of cab travel. The air seat offers the latest in comfort technologies. It is equipped with a low-frequency suspension system, a retractable seat belt, an adjustable armrest and backrest, lumbar support, and base cushion adjustment. The Maxxum SurroundVision cab offers unobstructed vision in all directions, including a high-visibility roof panel with optional opening window. The narrow, sloping hood is closely formed around the engine for excellent visibility of front-mounted implements. What could be simpler? Select your horsepower, then pick your configuration. 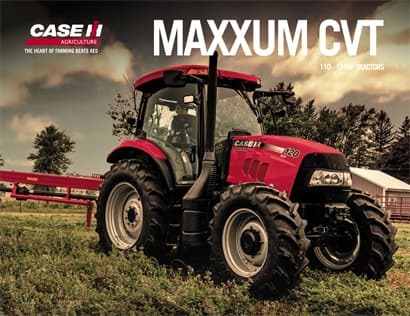 The new Case IH Maxxum series tractors are available in two configurations: with three horsepower offerings from 112 – 141 (92 – 121 PTO) engine horsepower. More work, less service time with 600 hour service intervals. The Case IH FPT engines keep working harder and longer. Designed by FPT, the Case IH engine delivers power and efficiency. Inlet and exhaust manifolds are positioned on opposite sides of the Maxxum cross-flow cylinder head, allowing the use of large inlet and exhaust ports for optimum air/fuel mixing and combustion. And all models feature cooling with a 9-blade viscous fan, which runs quieter than conventional fixed fans. The high-capacity fuel tanks permit longer work periods before refueling. A wide filler opening allows easy refilling from ground level, with no spilling of fuel, and a water in fuel sensor and tank guard are standard equipment on all Maxxum models. Maxxum 4-cylinder models feature 175 L capacity, while the Maxxum 6-cylinder model tank capacity is 250 L.
Fuel efficiency and reliability are hallmarks of the proven, Tier III engine in Case IH Maxxum models. This mechanical 2-valve per cylinder engine includes minimal electronics, for no nonsense control and horsepower without the frills. Easy to maintain and service, this workhorse will prove itself for years in the field. LIVESTOCK? ROW CROP? ROADSIDE MOWING? The Case IH Maxxum series offers you state-of-the-art features to help deliver better productivity and greater profitability. These tractors are designed to handle the multiple tasks of livestock operations, row-crop applications and roadside mowing with enhanced cab visibility plus power, fuel economy, ease of use and solid performance. The variety of Maxxum series models makes it easy to choose the tractor that’s best for your needs. First, pick your engine from 92 – 112 PTO HP. Then, choose your specification based on your need. Whichever you choose, you’ll get performance, productivity, and long, reliable service life. 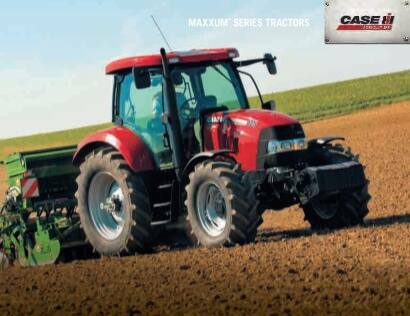 Nothing beats Case IH Maxxum tractors for flexibility, maneuverability and serviceability. Here’s the ideal tractor for the midsize farm, loader applications, haymaking, mowing, mixed farming operations with crops and livestock, and more. Get all the industry-leading features you want – and nothing you don’t – on this powerful, multipurpose machine. Maxxum transmissions give you the level of automation you need to optimise your productivity - both in the field and on the road. A fullyintegrated electronically-controlled PTO system on both models makes operating machinery safe and efficient. Maintaining 40 kph at reduced engine revs of just 1900 rpm (instead of 2200 rpm in 16th gear) means less wear to the engine and fuel savings of 10%. That represents a substantial reduction in your fuel bill if your tractor is being used for transport work as well as in the field. The rear PTO on all Maxxum tractors features a 540/750/1000 rpm system driven directly direct from the engine flywheel for maximum efficiency. A soft start system gradually increases output torque during start-up to reduce the strain on machinery and driveshafts. A 1000 rpm front PTO is also available for extra versatility. Easily-accessible PTO switches are located on the tractor fenders next to the hitch buttons so machines can be operated from the ground. AutoField and AutoRoad modes optimise the Semi-Powershift transmission and provide automatic shifting based on load for increased productivity and fuel savings. Gear shifts are smooth because they are based on load. Small loads and shifts will be slow, large and they will be fast. Boost productivity even further by operating front and rear end implement combinations simultaneously. Maxxum tractors are available with Cat II front linkages and a 1000rpm PTO fully integrated into the tractor with a maximum lift capacity of 3700kg. Long as they may be, workdays are too short to spend any more time than you have to tending to your equipment. Getting the most out of yourself, and your tractor, means spending your time getting the job done. So Maxxum tractors are designed for the long hours you put in, offering more uptime and higher productivity. Long story short, you get long days, long service intervals, long service life. Maxxum series tractors are designed to make maintenance quick and easy by offering excellent service access. For instance, for routine maintenance, there’s no need to remove the service side shields. In fact, you can check the oil without even raising the hood. In the spirit of keeping things simple, radiators and coolers fold out for convenient access. That means the cleaning process is quick and easy. Smart engine design offers more than power and economy – it also provides longer service intervals. Maxxum tractor engine oil and filter change intervals are both 600 hours. The oil filter is easily replaced from the left side of the tractor. Maxxum tractors feature a premium fuel filtration system as well as a standard water sensor that prevents damage to the fuel system. Like the oil change, the fuel filter change service interval is 600 hours, so it’s easy and convenient to schedule. It adds up to maximum fuel system protection for increased reliability and long component life.